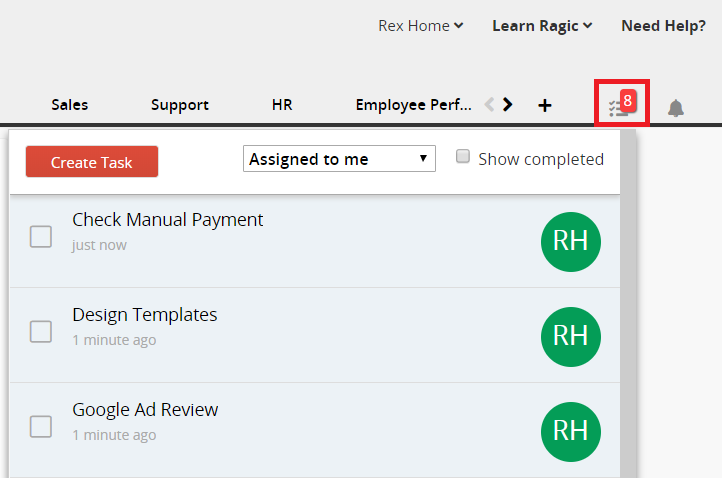 Clicking the task icon at the upper-right corner of your Ragic account page will list out the tasks users need to do in a descending order. Tasks can be generated from the system or manually assigned. Task items will gray out and will no longer show in the task list once the user ticks the "complete" checkbox. You can view all the completed tasks by ticking the "Show completed" checkbox on the upper right side of the task window, which will prompt you back to the default (uncompleted task) list. From there, you can also uncheck completed tasks. 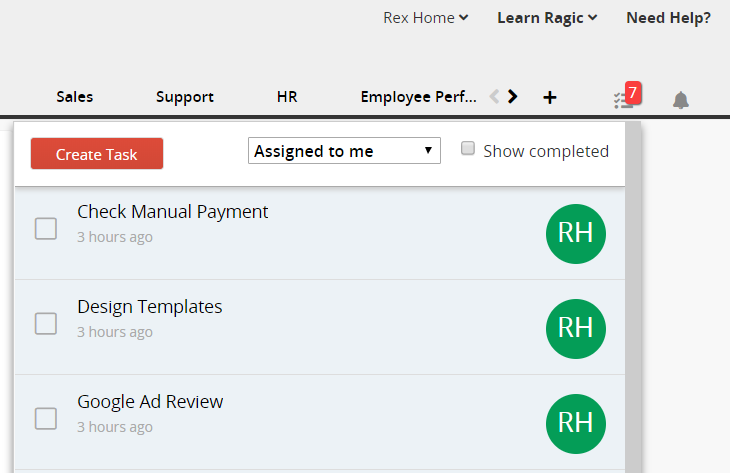 On non-supervisor users' account page, the list will show all the tasks assigned to other users under the same supervisor. On the other hand, the task list on the supervisor's account page will show all the tasks assigned to his/ her subordinates. You can also modify other users' task status in the task list. When the status is changed, system will send notification to whom the task is addressed. When other users start an approval flow which requires your approval, you will receive both an e-mail request and a task icon badge notification. Once you approve it via the email request or through the form page, the system will automatically mark it as "completed". When you're requested to review a certain entry, you will receive both an e-mail request and a task badge notification. Once you open the email request or view the form page of the entry, the system will automatically mark the task as "completed". When you're configured as the recipient of reminders, you will receive both an e-mail request and a task badge notification. Once you open the email request or view the form page of the entry, the system will automatically mark the task as "completed". 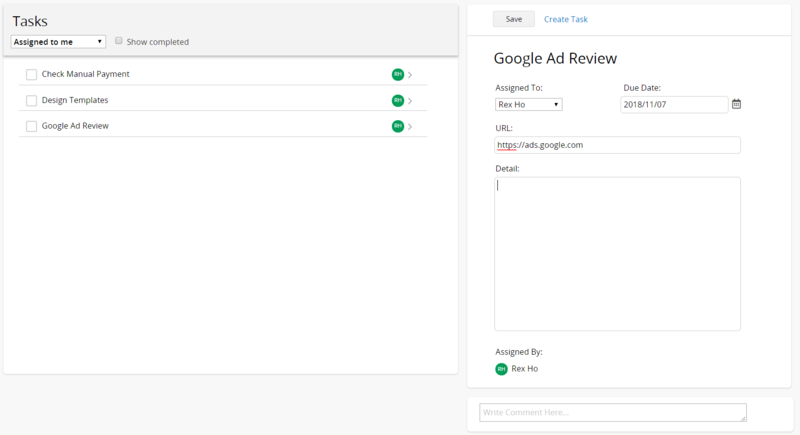 You can manually create tasks and assign them to other internal users. On the task icon of your home page, click Create task. In the pop-up configuration window, select a user you'd like to assign the task to, type in the task details, and click Assign. 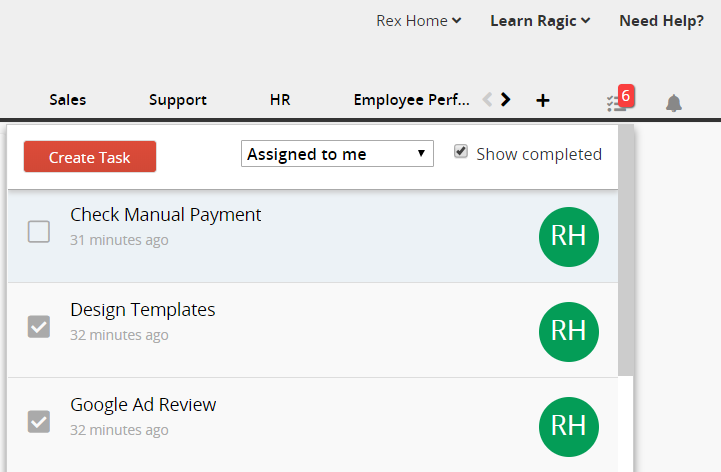 Once the task is created, the assigned user will receive an e-mail and a task badge notification on his/ her Ragic page. 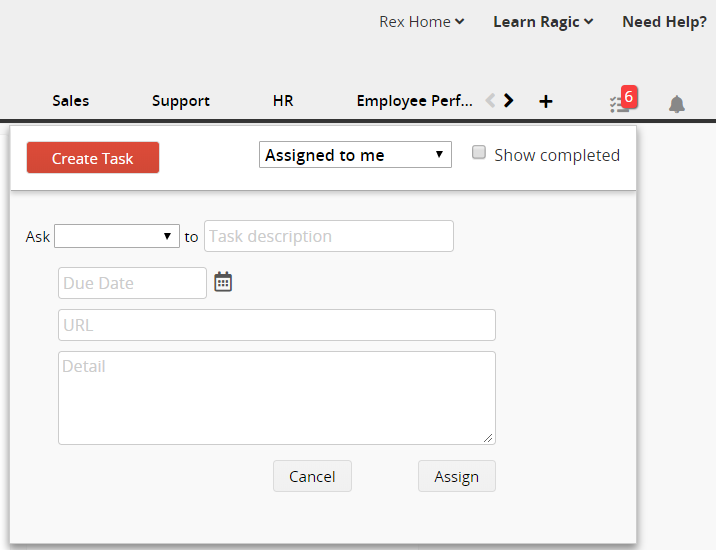 Once the assigned user completes the task and ticks the "complete" checkbox, the task creator will receive a task completion email notification. Clicking on one of the task items or the See Detail option on the bottom of the task window will prompt you to a new page where you can manage all the tasks. 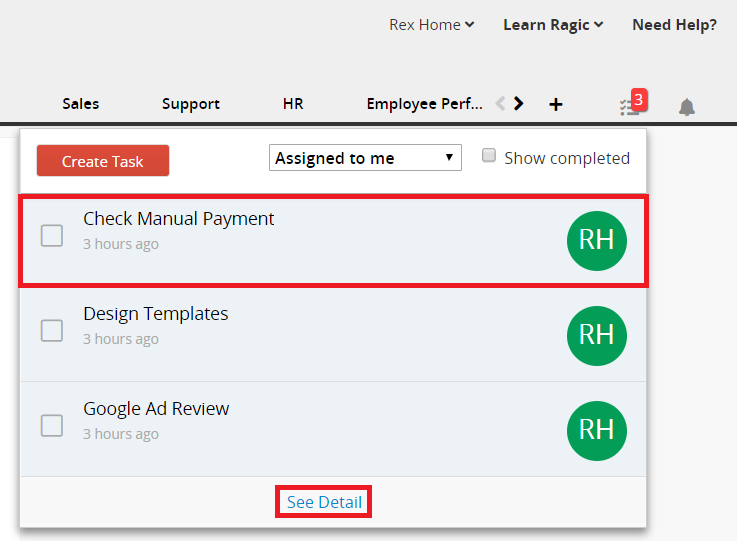 In the task detail page, you can see who assigned the task and edit the task's due date, URL, details and comments.